If you’re facing any move, you may want need to rely on professional moving services. This will ensure you get to where you need to go with greater ease. When selecting a mover, you should think about whether you will need packing, storage or other services during the process. Muscular Moving Men can be your one stop shop for all things moving! Muscular Moving Men got started in 2008 as a local moving service in Phoenix, AZ. The team at MMM can schedule your move across town from Scottsdale, AZ to Phoenix, AZ for a simple cross town relocation. Clients may also have to the need to relocate to or from destinations as far off as Flagstaff, AZ or Tucson, AZ. 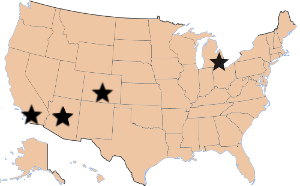 Whether you are moving to these destinations or coming to the valley, Muscular Moving Men has got you covered! Muscular Moving Men can service clients that are moving out of the Phoenix, AZ to other states or even pick up clients out of state and bring back to the valley. Utilizing a skilled staff of local and long distance drivers, our team can schedule your move and be competitive with other movers in the market. The in office staff will provide a clear price based on the list of item being moved and the locations. Muscular Moving Men has got you covered when it comes time to switch over your utilities at your new home. Once your move is booked a helpful member of the MMM concierge team will touch base with you to see what assistance may be needed to get prepared at your new home. Why wait until the last minute to pick TV or internet service? Use the helpful team at MMM to get the ball rolling. When it comes to moving businesses, you don’t want to leave the move to a company that is only focused on residential moves. Muscular Moving Men is 1 of 3 Phoenix, AZ companies that has been certified by the International Office Moving Institute (IOMI). The estimation and move process is entirely different when it comes to office moves. Trust the pros at MMM to provide you an accurate estimate and get the job done right! Relocating internationally? No problem, the team at MMM works with qualified freight forwarding companies in partnership to get the job done right. From the inventory and packing process to the delivery and debris haul away at the destination, you can rest assured the price will be competitive and the service will be second to none. When preparing for moving day, you have a decision to make as a consumer when it comes to the process of packaging your items. The time it takes to carefully wrap and place items into the proper sized box, mark and stack can be tedious. Let the Muscular Moving Men team sell you the necessary packing supplies and even handle all the packing for you! It is very common that clients will need storage during the moving process. More than 50% of moves require some length of storage time. What better way to take the stress away than let your movers store items in a brand new state of the art facility that is air cooled and surveillance monitored? Whether it be short or long term, we got you covered.